More photos: several views of the model and close views of details. Click on the photos for high resolution pictures! The NORSKE LOEVE was built in 1765 by the Nyholm shipyard, close to Copenhagen. The ship was named after the Norwegian Lion and the Danish-Norwegian Imperial Coat of Arms. There was a crew of 667 men and an armament of 70 iron cannons, with 26 cannons 24 pd. on the lower deck, 26 cannons 18 pd. on the middle deck and 18 cannons 8 pd. on the upper deck. All ornaments, made by the sculptor C. Moellerup, were reminders of Norway. On the transom there is a fisherman and a farmer, symbolizing the most important trades of Norway, agriculture and fishing. The Norske Loeve was used as a guard ship in the Oeresund and other Danish waters. In 1795 she was used to give shelter for homeless families after the fire in Copenhagen the same year. In 1798 she was deleted from the naval register. 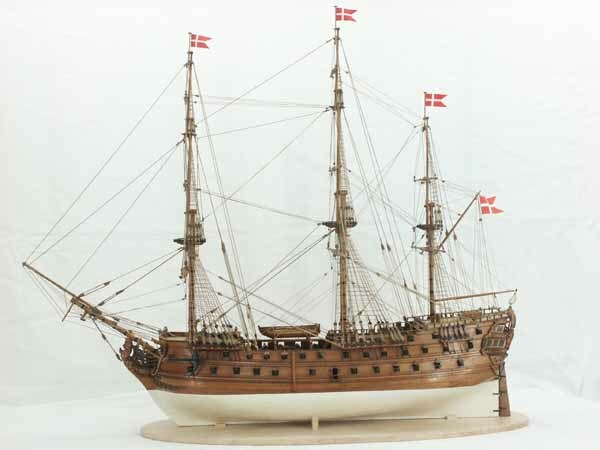 This ship model shows the NORSKE LOEVE in her late years, after replacing the lateen sail at the mizzen-mast with a gaff. The ship model was made in three years and four months work, with support from the state archives in Copenhagen. All parts are handmade, including the decoration carvings. The beautiful, very well done model of the NORSKE LOEVE is 1 : 75 scale. Length is 102 cm, width 39 cm, height 89 cm. There are more photos, several views of the entire model and close views on hull and rigging. Click images to enlarge!